The Closers 3 by Paul Democritou and Ben Gay III. 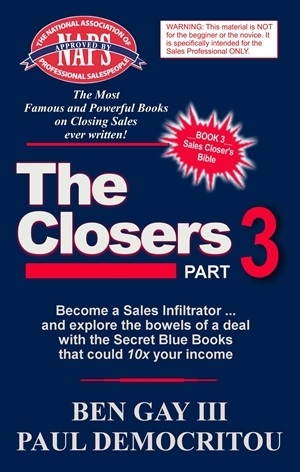 Graduate the level of Master Closer and become a Sales Infiltrator with the 3rd edition of the famous blue books by living legend Ben Gay III and Paul Democritou. “Levels of Salesmanship” and how to climb the Ladder of Success by thinking differently. Best Selling Author "The Closer's Series"
Ben Gay III has been called a living legend in the sales world. In his 40+ years of professional selling and sales training, he has been the #1 salesperson in every organization in which he has ever worked . 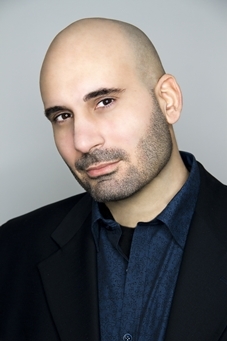 . . and he’s a powerful speaker/sales trainer/author to boot! Having started his first business at 14, by age 25 he was the president/CEO of what was then the world’s largest Direct Sales/MLM/Network Marketing company. 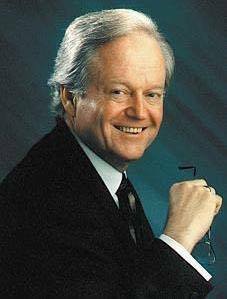 And he was personally trained by fellow sales legends J. Douglas Edwards, Dr. Napoleon Hill, Earl Nightingale, William Penn Patrick, Zig Ziglar, Merle Fraser, Fred Herman, James H. Rucker Jr. and many many other sales giants. Now one of the most famous, popular and powerful sales trainers in the world, Ben accepts and conducts just 24 live “The Closers Sales Training” seminars a year and writes/publishes/produces “The Closers” series of books, audios, videos, newsletters, and teletrainings . . . a series that is considered “The Foundation of Professional Selling. He was the founder and is the current Executive Director of The National Association of Professional Salespeople. Paul Democritou is an entrepreneur, sales and marketing expert, author, and a blockchain / ICO advisor. He is also known as an entertainer and director and was responsible as a video producer for over 15 VMA’s nd 2 EMA nominations. As a very successful sales and marketing expert in the timeshare industry which later expanded to other fields and companies, Paul provides online and offline training to companies and individuals. In 2016, Paul was diagnosed with Non-Hodgkin’s Lymphoma – cancer. He wrote a book on achieving success that was born as a result of vision and passion to help others succeed even in harsh conditions. Paul also recently wrote The Closers 3 with living legend Ben Gay III. He is also currently advising ICO’s in the block-chain industry. 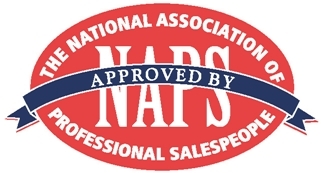 The National Association of Professional Sales People, having pledged to offer only quality products and services competitively priced to qualified customers and clients. Further, said member has pledged to adhere to the N.A.P.S motto “”Sum Tertius” meaning I am Third – God is first, the customer is second then am I.